Strategic partnerships are on the rise around the world as denominations, organizations, local churches and individuals seek ways to work together to accomplish the Great Commission. In this book Dr Kenneth Shreve presents research from a creative access region, identifying five theological issues that impact partnership in Christian missions as well as exploring how partners interact with those theological issues.Partnerships in mission are grounded in relationships, relationships that flow from the Trinity and are manifested in the purpose of God, the body of Christ, the gifts of the Spirit, and the church. Through this book the body of Christ will be encouraged to strengthen cooperation and collaboration in the accomplishment of the Great Commission, and achieve far more in partnership than could be done in isolation. 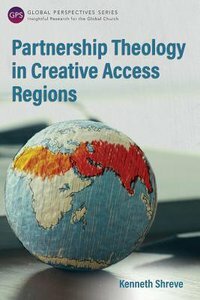 About "Partnership Theology in Creative Access Regions (Global Perspectives Series)"